Who doesn’t like Cheese?! 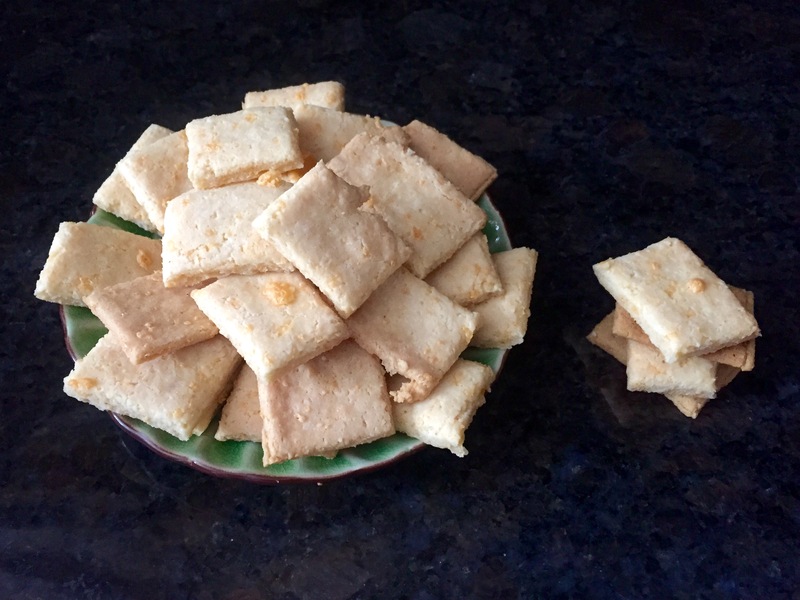 Cello’s Cheezy Cheez-Its is the newest recipe tried in Cello’s Cucina! As always, this treat is made with all organic ingredients, and is 100% grain-free. In a large bowl, whisk together the almond flour and tapioca flour. In a small bowl, lightly beat the egg. Then stir in the cheese and oil. Pour the cheese mixture into the flour mixture, and stir with a fork until thoroughly combined. Cut out a piece of parchment paper to fit your baking sheet, and use this piece as your work-space. Next, place the dough onto the parchment paper, and cover with a second piece of parchment paper. Using a rolling-pin, flatten the dough very thin (to about 1/16 inch). Remove the top piece of parchment paper and transfer parchment with the dough onto your baking sheet. Using a pizza cutter, cut the flattened dough into 1 inch by 1 inch squares. Bake for 15 minutes. Leave the treats in the oven to cool after the oven has been turned off to ensure they get nice and crunchy! Storage: These treats can be kept in the fridge for up to 1 month, or in the freezer for up to 6 months. Your pup will enjoy these grain-free peanut butter- carob “mock-choc” treats! These treats are made with buckwheat flour, which is surprisingly grain free! 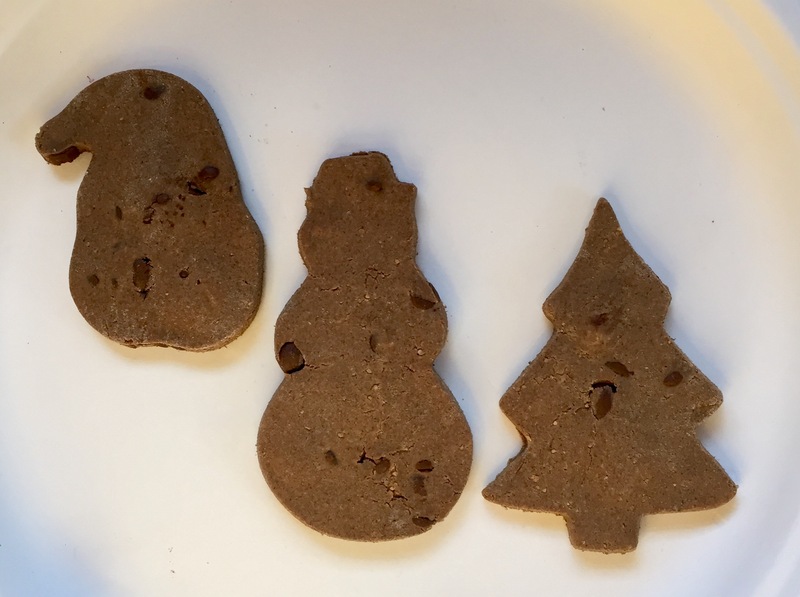 Of course dogs can not have chocolate, since it’s on the list of poisonous food to dogs, but your pup can enjoy the natural sweetness of the carob in this homemade dog cookie recipe. I chose Santa, Snowman, and Christmas tree cookie cutters since we are just days away from Christmas, but you can choose any cookie cutter you like for this recipe! In a large bowl, whisk together the buckwheat flour and carob powder. In a microwave safe bowl, warm the peanut butter for approximately 30 seconds. In a small bowl, whisk the warmed peanut butter and milk (or water) together with a fork until thoroughly combined. Make a well in the dry ingredients and pour in the peanut butter mixture. Fold in the carob chips. Place a sheet of parchment paper on a baking sheet. Using cookie cutters of your choice, cut our shapes in the dough. 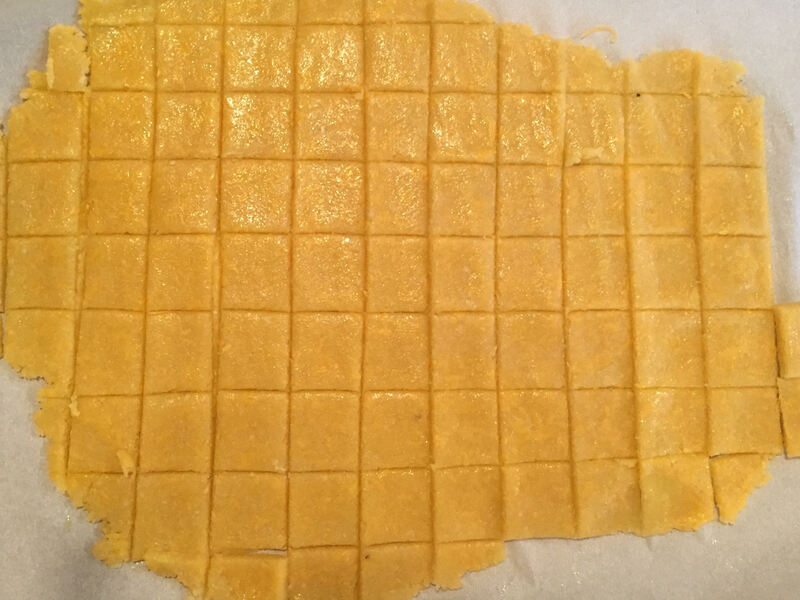 Bake for 15-18 minutes on a parchment paper-lined cookie tray. Cool completely on a wire rack. Or, for crunchier treats, leave in the oven, once turned off, to cool and harden for 2 hours. These treats will keep in the refrigerator for up to 2 weeks, or freeze for longer duration.